Remove the air cleaner box cover. Refer to “air cleaner element removal and installation” . Remove the air cleaner mounting bolt. Remove the air cleaner box bolt. 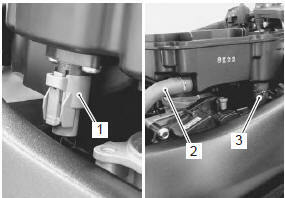 Disconnect the iat sensor coupler (1), pcv hose (2) and pair hose (3). 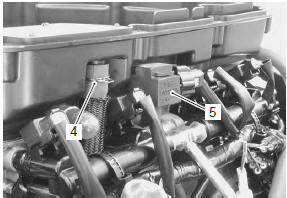 Disconnect isc hose (4) and iap sensor (5). Remove the air cleaner box. route the hoses properly. Refer to “throttle body construction” . Tighten air cleaner box bolts in the ascending order. Refer to “throttle body construction” . Refer to “air cleaner element inspection” in section 0b .